It is unfortunate that the charter school industry now finds itself on the wrong side of educational progress and civil rights history, even as industry spokesmen like Nelson Smith engage in a public relations campaign aimed to minimize awareness of the segregated conditions that exist in the majority of American charter schools today. Whether located in the poorest, brownest neighborhoods of the Twin Cities or in the leafiest, whitest suburbs of North Carolina, charter schools often engage in a form of intensely-segregated schooling that either contains and isolates minorities in urban centers, while offering middle class parents escape routes from traditional schools that are increasingly tainted by the burgeoning poor, which now comprise 20 percent of American children. Black children are as rare as atheists at the UNO charter schools in Chicago. 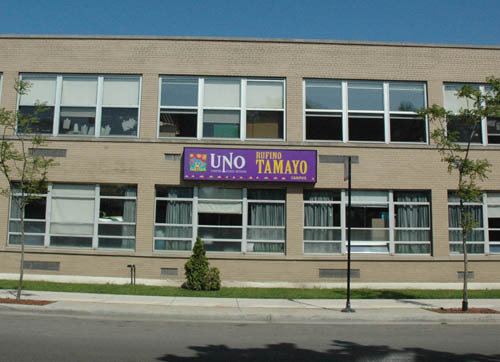 UNO's charter schools in the early days were located in former Catholic schools, like UNO Tamayo (above in 2007) at St. Simon's. Substance photo by George N. Schmidt.The segregative effects of charter schools, when compared to public schools, remains an empirical fact, notwithstanding Mr. Smith’s rhetorical squirming and recycled arguments against one of two research studies from 2010 that echo other studies like the ones linked above that document the same tendency toward apartheid. Borrowing from an earlier critique that was subsequently and effectively vaporized by Civil Rights Project researchers, Mr. Smith doggedly claims that researchers missed the mark by comparing charter school demographics to all schools within the charter’s surrounding district, rather than to the geographically closest public schools. In the response in April, 2010 to the charter industry’s attack on the study, Choices Without Equity: Charter School Segregation and the Need for Civil Rights Standards, researchers then noted that their study, in fact, included comparisons of charter schools populations to system-wide demographics and comparisons of charters to public schools that were geographical neighbors. If charter schools had some pedagogical advantage to recommend them, then perhaps the social costs of re-segregation, anti-cultural curricula, and total compliance instructional methods would be easier to accept. Perhaps. But in study after study after study over the past ten years, corporate charter schools, either the for-profit or non-profit varieties, are more likely to be academically weaker or no better than the public schools they seek to replace. The largest of the studies conducted by Stanford’s CREDO group included a longitudinal and peer-reviewed examination of 70 percent of the nation’s charter schools in 15 states and Washington, DC. Significantly, it was funded by supporters of the charter movement, who, no doubt, got results they had not anticipated. The study found that only 17 percent of charters do better than matched public schools, 46 percent show no significant difference in performance, and 37 percent do worse than matched public peers. Unfortunately, a very recent Fordham Institute study now finds that, despite the charter industry’s mantra that “bad schools don’t last—ei ther they improve or they close,” 72 percent of bad charters remain open five years after they were identified as bad. The close relationship between UNO and the Catholic schools is visible in this 2007 photograph. 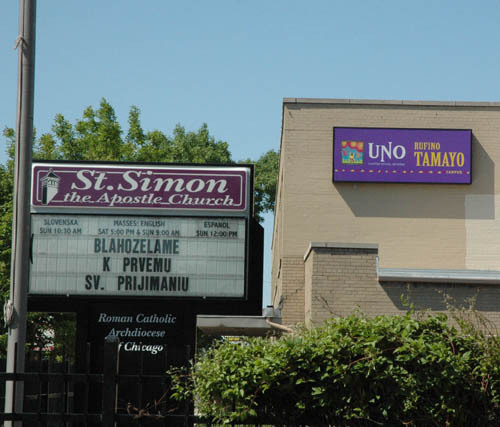 Less visible is the fact that in many ways, UNO, through its charter schools, is perpetuating the segregationist practices against black children that once characterized the majority (not all — just the majority) of Catholic parishes and schools in Chicago. Substance photo by George N. Schmidt.It may be hard to imagine the FDA recommending approval for a new drug that gets better results than available medicines in only 17 percent of the cases, and yet the U. S. Department of Education has based the $4 billion Race to the Top point system largely on whether states remove restrictions on the growth of these marginally effective corporate-run schools that collect public funds to operate. On top of that indignity, the Secretary of Education and his corporate foundation advisors chose to award no RTTT points to states or municipalities to effect or even incentivize school integration efforts or inclusion models, in charters or regular schools. While it was the original Elementary and Secondary Education Act of 1965 that provided the carrot that effectively served to end apartheid schooling in the South, could it be that ESEA’s next version will provide the most effective and perverse incentive to re-segregate America’s schools 45 years later? Why should we bother to fight segregation, other than the fact remains that Brown v. Board of Education declared 9-0 that separate schools are inherently unequal? From an economic point of view, class, racial, and ability integration offer a great bang for the buck in terms of raising achievement. In school systems that have been integrated based on keeping the percentage of poor children under 40 percent and the percentage of low performers under 25 percent, gains have been significant without increasing funding for additional resources. In fact, a recent study in Montgomery County, Maryland found that poor children in majority-middle class schools outperform poor children in majority-poor schools, even though the poor schools received $2,000 more per student yearly over a seven-year period. Other studies in La Crosse, Wisconsin, Cambridge, Massachusetts, and Wake County, North Carolina have shown similar results. Today approximately 70 school systems with over 3.5 million students enjoy the social and academic benefits of some form of diversity schooling based on socioeconomic integration and/or “controlled choice.” These programs could be spread to other cities if federal priorities were focused once more on educational justice, instead of the advancement of corporate-friendly policies like choice-without-voice charter schools that undermine our social aspirations, moral convictions, and ethical obligations. When then-AFT President, Albert Shanker, embraced charter schools back in 1988, it was for their freedom to seed and nourish curricular and instructional options that could be expanded or modified to make all schools better. By 1994, Shanker could see that the fledgling charter movement had been infiltrated and co-opted by the school choice advocates, with an anti-union and anti-public ideology that would henceforth steer the charter bus, to the detriment of school desegregation efforts that were already on the defensive due to Court decisions such as Milliken v. Bradley. As we approach another day of commemoration for the legacy of Dr. Martin Luther King, Jr., we may wonder what Dr. King would make of our current state of educational affairs, wherein education is declared by reformers, with no apparent irony, as the civil rights issue for a generation of children whose schools are more racially segregated by race and class than those of thirty years ago. We can only guess how he might respond to business and political leaders who offer segregated total compliance schools run by corporations as the only other choice for parents who desperately want something more than the malignantly-neglected public schools that have recently had the remaining trust and human caring squeezed out of them under the weight of test and punish reforms. Indeed, we may wonder what Dr. King would say to those federal officials and corporate foundation heads who view children principally for the future capital they will generate to maintain a corrupted anti-worker political economy and corporate welfare system that threaten to undermine democracy, equal opportunity, and free enterprise, itself. For the charter industry to accuse those who advocate for economic and racial diversity in schools of “racial gerrymandering” is a prime example of the iron pot calling the copper kettle black. The conscious creation of cheap, segregated containment charters for minorities in the northern cities and privileged white flight charter academies in the South and West is not the work of socioeconomic integrationists or the Civil Rights Project. It is the work of self-labeled bold reformers and disruptors of the “status quo,” whose engrossment in “market solutions” and bringing “efficiency to scale” has left them no less blind to the effects of their amoral enthusiasms than the well-meaning eugenicists who came onto the stage a hundred years ago during another Gilded Age. Aside from the offensiveness of Mr. Smith’s labeling, the weakest part of his defense of the charter industry is the failure to acknowledge that the success of any education reform will be directly proportionate to our success in mitigating poverty in neighborhoods continuing to struggle against malignant neglect, isolation, and racism. As long as poverty remains the too-big-to-fix (or even see) issue, education reformers' efforts in this new decade will suffer the same fate as the ones in the last and the ones before that. In the meantime, our society will have become further polarized by race and class, public education funds will be siphoned off by corporate welfare schemes, and the gains of the Civil Rights Movement will become a fainter echo from a bygone era. All hands on needed ! WE NEED ALL HANDS ON!!!! The UNO Charter was very organized and put on quite a show on Saturday morning at Doolittle. They even showed up with a man dressed up as Superman outfit. He was running through the isles shouting "We can't wait" and the crowd was emphatically cheering him on . We can not be out done by UNO or any other charters.There were only a few people to support public education. Even the media asked why there weren't supporters of public education there. I explained that the BOE had only given notice to the charters and we were only aware of the hearing a few days ago and that is after on of our CTU Organizers located it by doing an internet search. PLEASE attend the BOE Hearing on Tuesday January 18, 2011. 5:30- 7:00 and 7:00- 9:-00 We need everyone who believes in public education there. LET'S SHOW EVERYONE THAT THERE ARE MORE PEOPLE SUPPORTING PUBLIC EDUCATION THAN Those supporting charters. CPS is attempting to resurrect some of the charter school proposals that the Chicago Board of Education withdrew at the December 15th, 2010 Board Meeting. The proposals will be presented at three charter school forums scheduled with little notice. The proposals will be submitted at the January 26th CPS Board meeting for approval. Chicago Teachers Union members, parents, local school councils and education allies will be at these hearings to defend our neighborhood schools—NO new charter schools until the needs of the neighborhood schools are met! We need YOU there! Members of your school community can provide oral or written testimony at these hearings. You can include how the needs of your neighborhood school have not been met by the Board. If you cannot attend but would like to submit testimony please forward your testimony via email to alixguevara@ctulocal1.com or via fax to 312.329.8677. Transportation will be organized for the Tuesday, January 18th hearing. For more information call Lupe Coyle- 312-329-6227.